Hula hoops come in a range of sizes and weights. How can you decide which is right for you? The common wisdom advises beginning hoopers to choose a hoop that reaches from the ground to their navel or higher. But does that rule of thumb make sense? Hoops are more often around our waists than standing at our legs. We also know that the bigger the hoop is, the longer it takes to rotate all the way around on your waist, so you can push bigger hoops at a slower rhythm. This is true, but really what’s happening here is not about the size of the hoop, it’s the ratio of the hoop to the hooper. For example, my husband and I have the same length legs and are of similar height, but I have a smaller waist than he does. When he uses my hoop, it’s pretty fast paced for him. If he uses a bigger hoop, we easily can dance to the same beat. 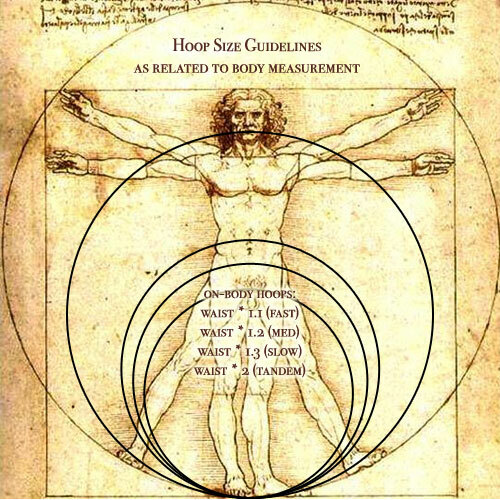 So maybe we ought to be using waist measurement to determine hoop size, not leg length, for our on-body hoops. Of course we don’t only hoop on our waists. There are off-body tricks, mini hoops and more. Still, the idea of using our bodies to figure out hoop size works in most cases. I’ve devised some new metrics for hoop sizing for a few different kinds of hoops and hooping styles. They use your own body as the seed for measurements, so your hoops will always fit you well. If you are buying your hoop from a shop, rather than making your own, use your measurements as a guide to find the closest size available. This give you a hoop diameter that might be right for you. This is just a rule of thumb. People who are extra tall or extra short, very stout or thin might need adjustments. Twin Hoops: With your hand held comfortably at your side, measure from your fingertips to the floor, and subtract an inch (or 3 cm). Use this measurement as your hoop diameter. This makes hoops that are easy to swing in poi style moves without hitting the ground. Mini Hoops: With your arm held out to the side, measure from your wrist to just before your armpit. Alternately, for buxom hoopers, hold your arm straight out in front of you and measure from the inside of your wrist to just before the bustpoint. Either way, this produces mini hoops that you can isolate and spin along the inside of your arm without snagging. Smaller is fine, too. Yoga hoop: Measure your inseam, from crotch to ankle. This allows you to use your hoop as a yoga prop and to do inverted walking meditations without catching on your torso. Tandem/meditation hoop: Waist measurement multiplied by 2 is a good place to start exploring these ultra-big hoops. This produces a hoop large enough for two to hoop in easily, or an extremely slow rhythm for a solo hooper. Whether you want a weighted hoop or one that is ultra-light is up to you. Heavier hoops are great for toning muscles and weight adds stability, but they can leave bruises and are sometimes too heavy for faster hoop tricks or tosses. Lightweight hoops are wonderful for long sessions of hand hooping and fast tricks, but they are harder to control because they tend to fly around. All hoops are good hoops for something! Even the much derided “kiddie hoops from the dollar store” can be fun to play with and make fine hoops for off-body hooping – no bruises – or a good challenge for waist hooping. * How did I come up with these multipliers? I did it partially by observation during my hooping experience, and a large part by math. I calculated some examples of hoop to hooper ratio. I used common hoop sizes as my base, and a range of US dress sizes for my waist measurements. I rounded to two decimal places and averaged the results to get the final magic number. I also did a survey of hoopers (pictured in the chart above) and incorporated their results into the final number. The larger the magic number, the slower the rhythm. As an aside, I noticed some interesting points in doing this math. For example, a 42″ hoop on a size 40 hooper has about the same ratio (1.20) as a 34″ hoop on a size 10 hooper. 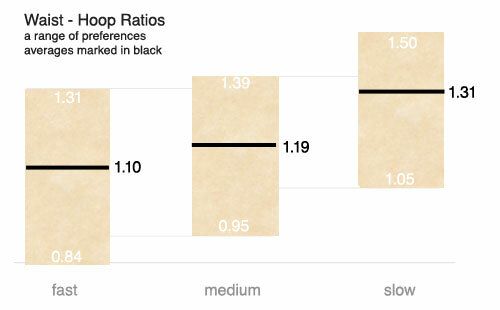 And in the survey, there was huge overlap about what hoop ratio was fast, medium, or slow. Hmmm, no wonder so many new hoopers are confused about hoop size and how fast we should be moving. What a fabulous calculation for the ever present question of what size hoop! This is great! Love how you came to the solution. Thanks, Tink! Fantastic post, Tink! I love your pics, too. I’m really curious now to compare these sizes to my preferred hoop size and see what comes up. 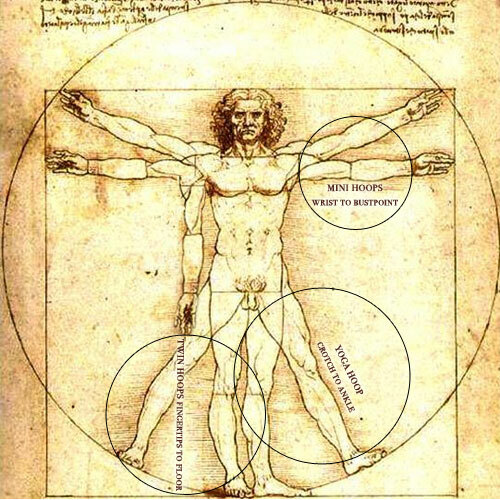 To understand this correctly– we are taking waist circumference and multiplying it to get the hoop circumference or the hoop diameter? Waist circumference * multiplier = hoop diameter. I’m sure you figured that out once you did the math for yourself. For example, a 70 cm waist * 1.2 = 84 cm hoop, which is “medium speed” for most people.